Follow in the footsteps of Spanish explorers and their search for the “seven cities of gold.” Sailing into the Gulf of Mexico, these explorers were amazed at this vast land and the many treasures it may hold. Searching high and low for the elusive gold, the Spaniards faced the wildest country and strange ferocious animals. They went for days without fresh water. Fearing their strength and luck had finally run out, they stumbled upon a mighty river, falling on their knees and crying, “los Brazos de Dios!” – the arms of God. They had found water, and with it the strength to continue their search. Little did they know the “gold” was all around them. It existed in the river and the land and the very nature of this place called the Brazos River Country. 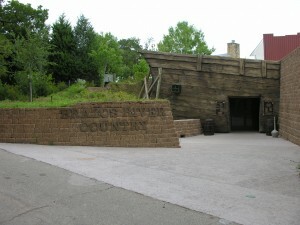 Visitors enter the Brazos River Country adventure through an excavation of a sunken Spanish galleon that showcases a 50,000-gallon marine aquarium. 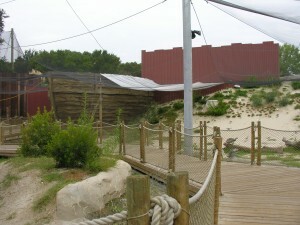 Guests then step onto a boardwalk that crosses over white sand beach. There, they can mingle with coastal shore birds before traveling through the swamplands where visitors view alligators from a dilapidated trapper’s shack or get a beaver’s point of view by crawling into a beaver lodge to see the gators from an entirely new perspective. Next, visitors explore the Piney Woods region of Texas where they encounter Cougars, Black Bears, and River Otters. 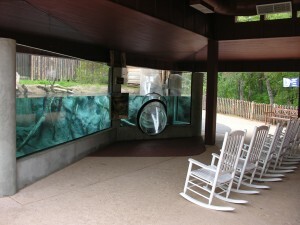 Children can climb a ladder into a forest ranger’s station to slide down a clear acrylic tube through the river otter habitat. In the Blackland Prairie region, visitors learn how some of Waco’s early inhabitants lived by visiting replicas of Huaco Indian huts. In the shelter of a cave, visitors can view a 35,000-gallon fresh water aquarium and see the paddle fish, an odd looking creature that has lived in parts of the Brazos River for thousands of years. Here, visitors will also see reptiles and amphibians that are indigenous to Texas. The largest inhabitants of Central Texas have not been forgotten – a tactile display allows visitors to touch replicas of mammoth bones protruding from the earth. While traveling through the Cross Timbers area, guests discover Jaguars, Ocelots, and Coyotes. Jaguars and ocelots once thrived throughout much of the state, but are now extinct in all areas of Texas except a small pocket in the South Texas scrub where ocelot sightings have been reported. The Brazos at Night exhibit, which is a barn along the Edwards Plateau area, houses nocturnal animals such as bats, owls, and cacomistles to allow the visitors an up close look at the diversity that is all around us but is usually under the cover of darkness. Amid teepees, visitors can view the Bison exhibit in the High Plains/Cap Rock region where the mighty Brazos is just a trickle. Educational graphics describe the teepees used by many nomadic Native American tribes, highlighting the functional architecture of these remarkable dwellings. The Brazos River Country is one of the brightest jewels of Cameron Park Zoo’s many treasures.